A sun-grazing comet is a comet that comes within about 50,000 kilometers of the Sun, so that it passes through the solar atmosphere and may actually fall into the Sun. Records of sungrazing comets go back many centuries. In the late 1880s and early 1890s, the German astronomer Heinrich Kreutz (1854–1907) studied the possible sungrazing comets that had been observed until then and determined which were true sungrazers. He also found that the genuine ones all followed the same orbit, with a period of about 800 years, indicating that they were fragments of a single comet that had broken up. To this day, all comets seen to graze the Sun have been members of the Kreutz sungrazers group. The parent may have been a bright comet seen by the Greek astronomer Ephorus in 372 BC to come close to the Sun and then break in two. 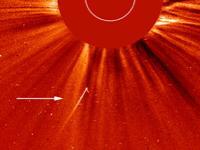 Several hundred sungrazers have been observed by the SOHO spacecraft out of a total population of perhaps 200,000, the smallest of which may be less than 10 m across.